The Feast of Unleavened Bread is the second of the seven feasts God commanded the Israelites to keep in the Old Testament. As the seven feasts are grouped into three, the Feast of Unleavened Bread is grouped with the Feast of the Passover. It’s celebrated the day after the Passover, on the 15th day of the first month of the sacred calendar. The Lord’s Passover begins at twilight on the fourteenth day of the first month. On the fifteenth day of that month the Lord’s Festival of Unleavened Bread begins. To show its proper meaning, one feast can have multiple names in the Bible. In fact, the seven feasts have more than 15 names. Regardless of the different names one feast may have, it is still the same feast. The Feast of Unleavened Bread is also called a feast lasting seven days in in the book of Ezekiel (Ez 45:21). God established the seven feasts through the work of Moses to forgive the sins of His people. And as they were to be fulfilled by Jesus Christ, these feasts were not only for the Israelites of the Old Testament, but also for Christians today. The Bible records that during the time of the Israelites, God commanded His people to keep the Feast of Unleavened Bread. According to the sacred calendar, the feast begins on the 15th day of the first month. After demanding the Israelites to leave Egypt , Pharaoh immediately changed his mind and sent his army to capture them. As Pharaoh’s army approached, the Israelites cried out to God for protection. They endured hardships and suffering as they escaped from Egypt. The scriptures show that God protected His people by allowing Moses to use his staff to divide the Red Sea. The Bible narrates how the Israelites crossed the Red Sea on dry ground with walls of water stretched high on both sides, while God continued to keep His promise of protection by placing a pillar of fire in front of Pharaoh’s army. The endurance of the Israelites through difficulties at the time of their release from slavery became the origin of the Feast of Unleavened Bread (Ex. 14:1-31). People commemorated the Feast of Unleavened Bread every year, eating unleavened bread (bread made without yeast) for seven days from the evening of the 14th day of the first month to the evening of the 21st day of the month (Ex 12:18). This is why the feast is also known as the feast lasting seven days. Eat it with bread made without yeast. For seven days the bread you eat must be made without yeast, as when you escaped from Egypt in such a hurry. Eat this bread – the bread of suffering – so that as long as you live you will remember the day you departed from Egypt. During this feast, God had them use the bitter herbs and bread made without yeast so that they might remember their suffering when coming out of slavery under the Egyptians. This unleavened bread was called the bread of affliction or the bread of suffering. 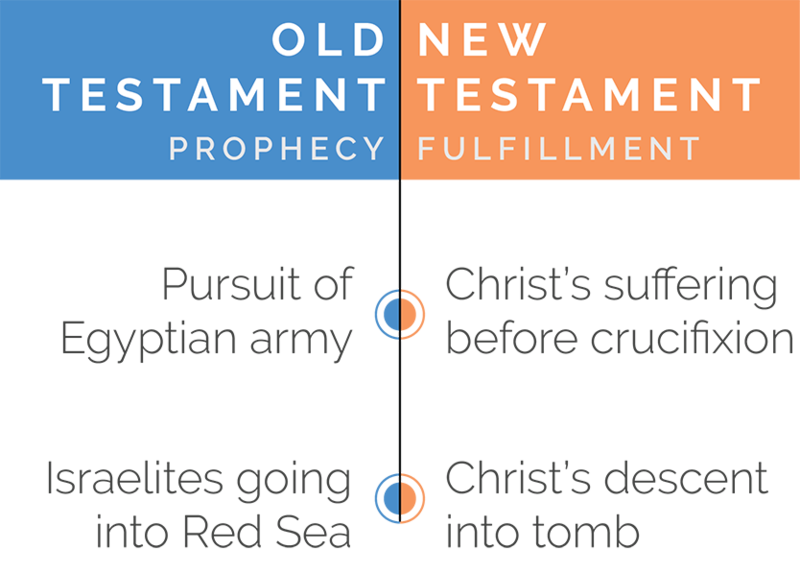 God established the feasts through the works of Moses as prophecies, and Christ was to fulfill them in the time of the New Testament through His works. The Feast of Unleavened Bread represents the suffering Jesus underwent from the Passover night until His death in the body on the cross. The Israelites’ difficult journey into the Red Sea represents Jesus going into the tomb after His death. The Israelites coming out of the Red Sea represents His resurrection. Today, we can understand the meaning of this feast by undergoing baptism . I don’t want you to forget, dear brothers and sisters, about our ancestors in the wilderness long ago. All of them were guided by a cloud that moved ahead of them, and all of them were baptized as followers of Moses. and this water symbolizes baptism that now saves you also – not the removal of dirt from the body but the pledge of a clear conscience toward God. It saves you by the resurrection of Jesus Christ. By commemorating the Feast of Unleavened Bread, we, as Christians, can participate in Christ’s suffering and God grants us power and strength to endure and overcome the hardship and difficulties we may face. Not only did Jesus Christ fulfill the Feast of Unleavened Bread, but He also set the example of keeping the feast in the New Testament. The Passover and the Feast of Unleavened Bread are grouped together and celebrated one after the other. So in the New Testament, both feasts together are referred to as the Feast of Unleavened Bread. Jesus’ disciples prepared and celebrated the feast in accordance to how Christ commanded. Jesus kept the Passover with His disciples on the 14th day of the first month by the sacred calendar. The next day – the 15th day of the first month – Jesus suffered and died on the cross for our sins. According to the teaching that Christ gave us, once the bridegroom – who represents Jesus Christ – is taken from His people, they will fast. In other words, after the death of Christ on the cross, the disciples should fast. Today, when we celebrate the Feast of Unleavened Bread, we commemorate Jesus’ crucifixion and death on the cross. And therefore, we celebrate the feast with fasting.